If you love your bagel, waffle or bread toast well-browned, then this review is for you. An undeniable truth is that many of us can’t do without a few slices of toasted bread or bagel every morning. In fact, this has become central to breakfast. Unfortunately, many people don’t end up with a good slice. It’s either burned, too brown on one side, or has to squeeze the slices inside the small slots. Many also complain of burning their fingers or hands due to the hot surface or the lift not working as desired. 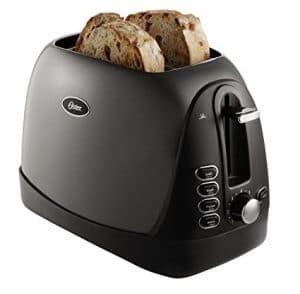 We decided to take at top 10 best bread toasters in 2019 by mostly focusing on the key features. 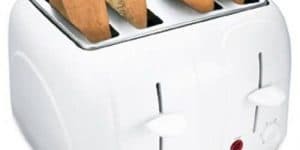 Toasting Slots: This accessory comes in two or four slots. Speed: A good toaster browns the bread relatively fast. In fact, a fast two-slot toaster may be more effective than a slow four-slot toaster. Lift: A device with extra lift makes breads or bagel removal easier and also reduces odds of burning your fingers. Setting: The more the settings, the more versatile a unit is. This allows for browning of bagels, fruit loafs, crumpets and more. Timer: A countdown timer is increasingly gaining popularity and helps to avoid under-browning or burning the toast. Most emit a sound to alert the user when the toast is done. Other possible features include bun warmer, sandwich toasting cage, auto shut-off and adjustable shade settings. 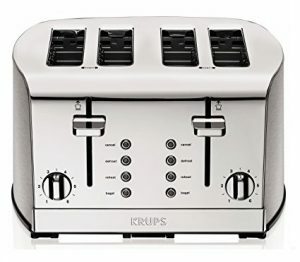 Toasting up to 4 slices of bread without burning your fingers is more certain with this toaster. The Proctor-Silex 4-slice toaster comes with a cool touch exterior that also makes removing the toast easy. It features wide slots for easy insertion and removal and also ensures there is good heat distribution. Consumers also praise this piece for its effective removable slide-out crunp tray; cancel button and being suitable for bagels and waffles. Unfortunately, some top regions aren’t very cool-to-touch. 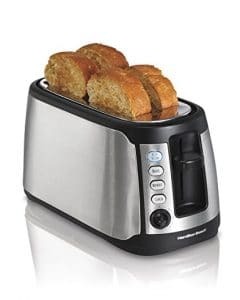 The Hamilton Beach brand proudly presents this 2-slice toaster. It features fairly wide slots that can fit even the thickest of slices, waffles or bagels. The elegant piece comes with a shiny chrome exterior which is also easy to wipe and clean. To minimize accidental burning, the toaster has cool-touch walls. Other features are toast shade selector, auto shutoff, and smart buttons. Some users claim that the lever is a bit weak and may break when too much force is used. Boasting of a well-polished and simple design, the KRUPS KH734D Breakfast set can accommodate up to 4 slices at ago. It features wide slots that measure 5.75 x 1.5 inches and will fit large slices. 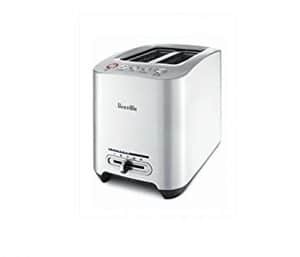 To enhance its elegance and cleaning, the toaster is constructed from chrome stainless steel. Other than bread, it’s also fit for English muffins, waffles, bagels, and buns. Unfortunately, the unit doesn’t get really hot. 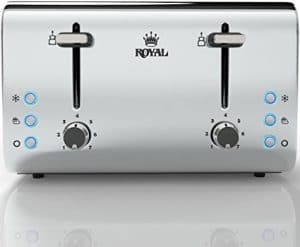 The Royal RYT toaster is suitable for bread, bagels, waffles, baguettes, buns and more. It is made from premium polished stainless steel and features 4 wide slots. The accessory heats relatively fast courtesy of the 850-watt element. The 7 adjustable settings allow the user to select the appropriate heat/temperature whereas the LED light indicators show the selected options. To enhance safety, it comes with a cool-touch exterior, Cancel, Reheat and Defrost. The Oyster brand is fast gaining popularity in regards to effective toasters. The 6331 Inspire is undoubtedly one of the top variants and can accommodate 2 slices. 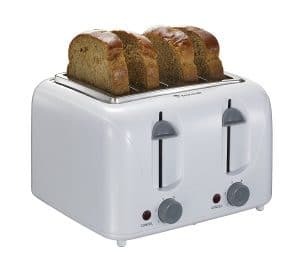 It relies on superior Electronic Toast Technology that evenly distributes heat for consistent results and energy conservation. It features extra-wide slots for easy insertion and removal, the High-lift lever for improved convenience and Cool-Touch housing to reduce burnt fingers or hands. A removal crumb tray, blue backlit LED, frost-to-toast function, and bagel setting are other worthy features. The plastic on the top getting hot appears to be its main drawback. This 4-Slice toaster by Hamilton Beach comes with long slots that are perfect for small, medium and large slices. It can also fit bagels, waffles, and buns, and will keep your fingers cool and protected from heat thanks to the cool exterior. The unit measures 15.75 inches deep, 7.5 inches wide, and 7.75 inches high. For easy and safe removal, the 24810 includes a high lift and cancel button. 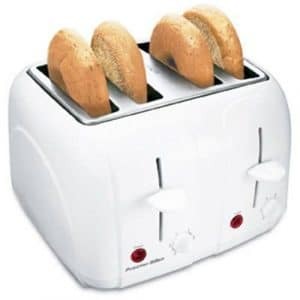 Though optional, the warm setting will keep the slices or bagels warm while inside the slots. The under-base cord wrap, unfortunately, doesn’t appeal to some consumers. 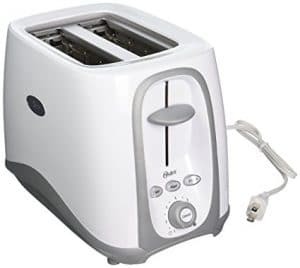 Although looking very basic and simple, the Oster TSSTTRJBG1 Jelly Bean is among the respected toasters in the market. It comes with 2 extra-wide slots that can accommodate bread slices, bagels, waffles and other items. The auto-adjusting guides ensure the slices are evenly browned while minimizing the possibility of one side getting over browned or burned. Also included are auto shut-off, anti-jam, toast lift and removable crumb tray. This unit is a bit underpowered and takes slightly longer compared to other top sellers. Made from brushed stainless steel, the 22910 toaster from the Hamilton Beach brand is meant for 2 slices. The extra-wide slots can accommodate large slices and also create sufficient space to minimize uneven browning. The unit comes with a convenient slide-out crumb tray, high lift, cord wrap and shade selector. It’s also ideal for buns, bagels, and waffles. According to some reviews, the unit feels rather weak and should be handled carefully. The Bonsaii T869 toaster can fit 4 slices and features 6 shade settings that enable a user to easily select the most-preferred browning. 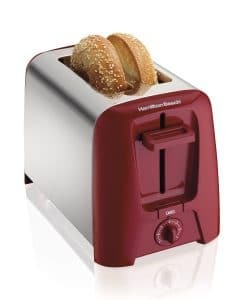 The stylish piece boasts of a high-lift lever for quick and easy toast removal, manual cancel function, and easy-clean and convenient removable crumb tray. The included anti-slip mat keeps the unit stable while the under base storage keeps the cord safe. Some consumers’ claim that is isn’t the best for very large slices. Made from die-cast metal, the Breville BTA820XL takes the pole position on our review. Firstly, it’s respected for evenly browning bread, waffles, bagel and other food items. Secondly, the 900-watt unit comes in a decent size (13-1/4 x 8-1/4 x 9 inches) and can be placed on most countertops in the home and office. Thirdly, it features a built-in smart chip that easily and conveniently lowers bread after hitting the button. Fourthly, it comes with variable heat setting for different browning shades. Other reasons making it a top product is an end-of-cycle beep, lift-and-look function, Defrost, Bagel, push-button control and convenient cord wrap. Your bread slices, waffles, bagels, buns and other items shouldn’t get burned or have uneven browning. You shouldn’t keep burning your fingers after accidentally touching the toaster’s exterior or trying to remove bread slices from the slot. You also shouldn’t wait for too long because the unit emits undesirable heat. 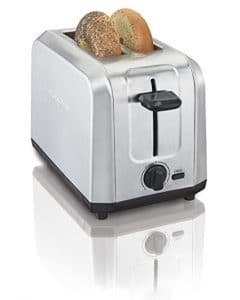 What you require are the top 10 best bread toasters in 2019. In addition to even browning, easy removal, and quick heating, the featured toasters also come with a cool-touch housing and efficient lift.